There is nothing to talk about the touch screen feature in Nokia 5800 XpressMusic, sure it's a new feature in Nokia's phone line-ups. But touch screen had becoming a standard in smartphones, and it's already been around long before N5800 arrived. Aside from the touch screen hype being cooked at Nokia's marketing kitchen, there's on more spotlight we should consider to look at: Comes With Music (CWM) service. Now some of you, who have been following the news around mobile world must've knew about it already. But for you who haven't here's a simpler way to find out. Q: Comes with Music lets customers buy an unlimited number of tracks from the Nokia Music Store but are there any limitations or restrictions? A: Comes With Music gives people a year of unlimited access to the Nokia Music Store catalog--from millions of tracks from a wide range of artists, including international hits and local talent--with the capability to keep all downloaded tracks. Q: After a year, what's the cost to continue the service? A: Once the Comes With Music first year service has expired, users can keep all the music they've downloaded and continue to update their collection with a la carte purchases. Pricing of a la carte depends on the Nokia Music Store pricing in the various regions. Q: Will the tracks just be limited to use on the phone or can they be downloaded to users' computers as well? A: Nokia provides seamless access to a world of music--people can download music directly to their Comes With Music device or via their compatible personal computer. Plus, people can easily transfer tracks and playlists between their Nokia device and computer using the Nokia Music for PC software. Q: Will the tracks come with DRM protection? A: Tracks and playlists can be shared between registered Comes With Music users (subject to confirmation that the user holds an active Comes With Music license). Users can play downloaded songs on the mobile device and personal computer that have been registered with the Comes With Music account, and transfer tracks between the registered devices. 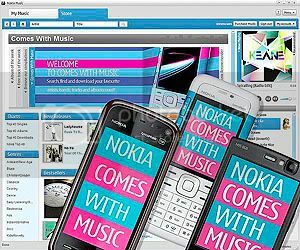 Users can purchase additional rights for the songs via the Nokia Music Store link, if they wish to burn tracks to CD or to sync to unregistered devices. Q: What's available in the Nokia Music Store catalog? A: All the major labels--including Universal Music Group, Sony BMG Entertainment, Warner Music Group, and EMI--have signed up to support Comes With Music, as well as a range of independent labels. Q: What are the rollout dates for Comes with Music? Specifically, the US? A: The United Kingdom will be the first market to offer Comes With Music with sales planned to start on October 16. Nokia is planning to announce additional Comes With Music markets in the coming months, but has not made that specific announcement at this time.